A Botched Vaccine Campaign For Measles Killed 15 Children in South Sudan : Goats and Soda The children, all under age 5, died of severe sepsis and toxicity. How could something like this have happened? A Sudanese nurse prepares an inoculation against measles. In the case of the children who died or were sickened from the vaccine, untrained personnel administered it. In a tragic turn in South Sudan, an effort to protect 15 children ended up killing them. The children, all under age 5, died of severe sepsis and toxicity due to a botched vaccination campaign, according to a joint statement issued Thursday by UNICEF and the World Health Organization. The vaccine had been left unrefrigerated. One syringe was reused over the course of four days. 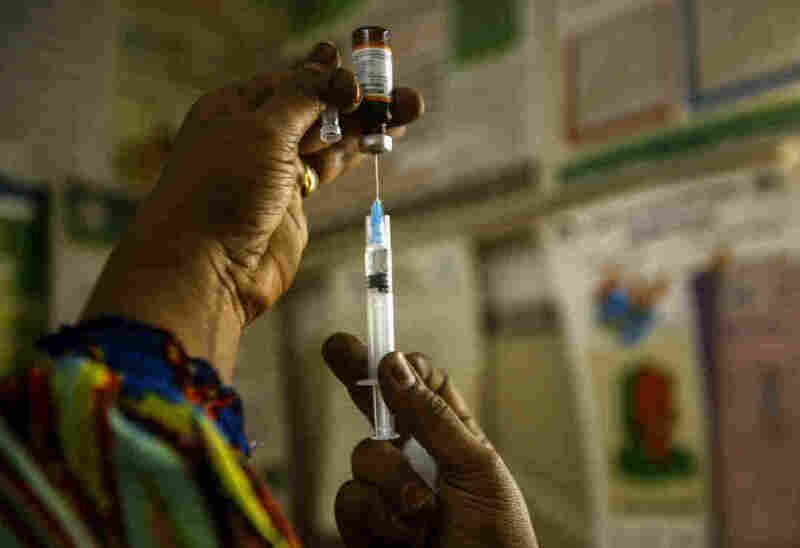 The campaign, which took place in early May in the rural town of Kapoeta, was part of an effort by the South Sudanese government to vaccinate 2 million children against measles. The vaccines were provided by UNICEF. The World Health Organization provided some training in how to administer the vaccines. We talked to William Moss — a professor of epidemiology and immunology at the Johns Hopkins Bloomberg School of Public Health and the head of epidemiology at the International Vaccine Access Center — about what went wrong. This is a tragedy on so many levels. How could this have happened? South Sudan has been plagued by a civil war, conflict, famine and other outbreaks for three years. Measles vaccination campaigns are complex operations with logistical challenges — and this is a place with poor health infrastructure. That's not an excuse, but it provides some context in understanding how such a thing could have happened. In addition to the deaths, 32 children were sickened from the 300-person vaccination campaign in South Sudan. What went wrong, exactly? Untrained people were administering the vaccine. The measles vaccine needs to be diluted. One has to take a liquid and mix it with the dry form, and that's where the error occurred. The [WHO and UNICEF] report says they used the same syringe to reconstitute the vaccine [instead of discarding it after single use]. If that vaccine vial gets contaminated with a toxin or bacteria, then gets injected into a child, that's what causes disease and death. Some reports are saying children as young as 12 years old were administering the vaccine. I have never heard of children being used in a vaccination campaign before, so this would be highly, highly unusual. Measles is administered with a needle and syringe. In measles vaccination campaigns, it's trained health care workers who deliver the vaccine. For polio vaccines where it's oral, you can have trained lay people administer the vaccine, but not children. If in fact children were administering the vaccine, that's inexcusable. Does this show that there was pressure to rush this measles campaign in South Sudan? In 2016, there were 2,294 suspected measles cases. Measles is a public health problem [in South Sudan]. A measles outbreak can be devastating with high death rates in part because of the undernutrition of the population and the lack of access to health care services. You have the urgent need to get the population vaccinated — but in this village where [this vaccination campaign] occurred, there was improper staffing in terms of administering the vaccines. Do you anticipate this will slow down vaccination campaigns around the world? That's obviously a big concern. This is a tragedy on multiple levels, primarily for the children and families who were involved in this. When an event like this happens, there's a lot of concern that this will decrease the willingness of parents to have their children vaccinated against measles. What people need to know is that this is a rare event. The problem is not the measles vaccine, which is very safe. This is a failure of the health system. According to the Red Cross in South Sudan, some mothers are angry and are unconvinced they should take their children to get vaccinated. What will groups need to do to reassure these mothers that vaccines are safe? The organizations involved in the campaign, such as WHO and UNICEF, need to ensure that anyone administering the measles vaccine in South Sudan is trained and qualified to do so. The government of South Sudan needs to ensure that this doesn't happen again. Oftentimes in these types of settings, it comes down to community leaders. Groups like the Red Cross and [aid groups] on the ground would need to engage with those leaders to point out the value and importance of measles vaccinations, particularly in these communities at high risk of measles outbreaks and deaths. If not, it might be extremely difficult to turn this around. Given the anti-vaccine movement in the West and skepticism about vaccines in many poorer nations, how much of a setback is this for vaccine efforts around the world? The anti-vaccine movement is complicated. But my understanding is that the argument against vaccines is not based on this type of event. They raise different issues, but not around the possibility of a vaccine vial getting contaminated with bacteria or people dying from toxins. Still, events like these generate a lot of negative publicity around vaccines. Anytime there's an event like this, it's a major setback for the global vaccine efforts. It takes a long time to establish trust. What else should we know about the measles vaccine? We have to remember that the introduction of the measles vaccine saves millions of children's lives each year. Prior to the introduction of the measles vaccine in the 1960s, millions of children died each year from measles. Now slightly over 100,000 people are estimated to die each year. This is an enormous public health success story. This is why the measles vaccine campaign continued in South Sudan after this tragedy. This wasn't a problem with the vaccine. This was a problem unique to that village.